This recipe is my mom's famous recipe, with a tiny bit of spices added in by me. It is always a big hit with the kids, and the adults can add tabasco, or hot sauce to their liking. This is also one of my favorites to make, especially since I can put all of the ingredients in the crockpot in the morning, and let it sit on the low setting all day. I normally add the sugar, a spoonful at a time, stir, then taste. I also found it is very easy to add the cumin and chili powder while the hamburger is cooking in the frying pan. I often serve this with, cornbread, shredded cheddar cheese, sour cream, and crackers. The nice Ziploc round containers work very well if you have any leftover and would like to freeze it. This also works great if you would like to send some to the neighbors'! We have been eating this chili recipe for several years, and I try to make it at lease once per month. All of my kids, (all 4), have loved this stuff since they were old enough to eat with a spoon! Although, Aaron, my 8 year old, will complain a bit since he has decided to become a very picky eater about a year ago. But he ends up eating it. lol. Deegan, he is 1, loves it so much, I can't shovel it in his mouth fast enough! He does fairly well with a spoon and fork, but he sometimes has an issue getting soups, chili, and certain cassseroles from his dish, to his mouth. Genevive, our 4 year old, absolutely loves it! She's pretty easy to please, and loves meat and green peppers, (2 of her favorite foods). So, she will have seconds and yes, it is a little messy, but nothing makes you feel more content then your 4 year old thanking you for dinner and telling you that you are the best mommy in the world and the best cook! Statements like that, make me melt, and forgive messiness and certainly some other things that I probably shouldn't, lol. 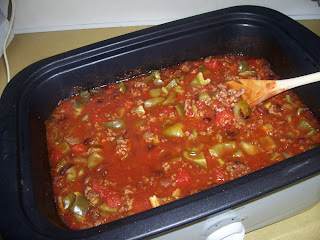 If you have a favorite family chili recipe, I'd love to hear about it! Please make a comment with your recipe link! Another plus, a very huge plus, is that this is a very inexpensive dinner to create! I am working on getting our families weekly menus posted on this blog, along with our shopping list. I hope to have this up soon! It scares me to talk with so many people who end up paying so much for their groceries, and family dinners. I will normally try o explain a short version of how our menus are planned and how we save so much with and without coupons. I do research every flyer from the stores that I frequent, and write all of the good deals down. Then, I will go through each, as some are repeats, and see which stores have the most of what I will need for the week, (to narrow the stores down). After figuring out where I need to go, in order to get every single thing on sale, or at a very low price, or free, (cause I will never buy it without a sale, coupon, or extra awesome deal! ), I start our week, and sometimes 2 weeks worth of menus. This also makes it very simple when planning your shopping trips, especially when there are a few little ones with you. But my very favorite part of this is that I don't have to plan to make something last minute, or find out that I ran out of something, or forgot to buy it when I need it! I'll be posting more of this strategy in the near future! Your welcome;p I hope you like it!